Family can be messy, but when a sourly dysfunctional family with such a venomous matriarch, such deep-rooted conflicts and tumultuous secrets come together under the one roof, we can expect it to implode in spectacular fashion. In the scalding, emotionally charged August: Osage County, directed by John Wells and adapted for the screen by Tracy Letts (Killer Joe) from his own Pulitzer Prize-winning play, a brilliant ensemble cast trade verbal blows in the rural Midwest. 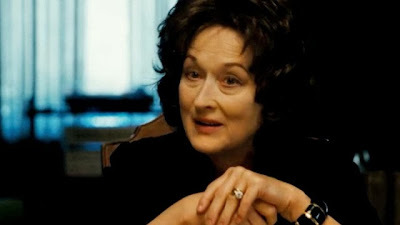 Darkly hilarious and brimming with intensity, this complex family drama perhaps overstays its welcome and lathers on too many skeletons, but has a deeply affecting resonance thanks to the extraordinary work of Meryl Streep and co, and one firecracker of a screenplay. The film’s opening sequence introduces us to Beverly Weston (Sam Shepard), a renowned poet with a drinking problem, and his wife Violet (Streep). Violet suffers from mouth cancer and has been left with signs of aggressive chemo treatment. She has also developed an addiction to prescription drugs, and with Beverly no longer willing or able to take care of her, he has hired a caregiver. A few weeks later Violet’s daughter Barbara (Julia Roberts) receives a call from her sister Ivy (Julianne Nicholson). Violet – wearyingly negative, consistently intoxicated, and spewing hateful insults – is distraught by the sudden disappearance of Beverly, which results in the entire family being called upon to search for him, only to find out that he has committed suicide. Barbara’s husband Bill (Ewan McGregor) and daughter Jean (Abigail Breslin), her sister Karen (Juliette Lewis) and fiance Steve (Dermot Mulroney), along with Violet’s sister Mattie Fae (Margo Martindale), brother-in-law Charles (Chris Cooper) and nephew ‘Little’ Charles (Benedict Cumberbatch) assemble at the Weston house following the funeral. From there tempers flare as long-term frustrations combust, secrets are uncovered, and a slew of grievances follow with nobody evading involvement. Violet comes to realise just how toxic her influence over her divergent family has been, and how the lives of her daughters have been forever affected as a result.